MEDICAL COSTS SINCE MAY 2014: $3,485.95 PLEASE CONSIDER MAKING A DONATION! 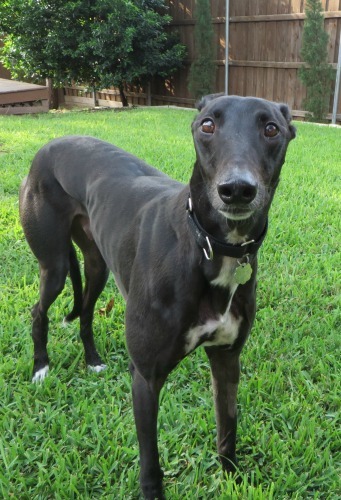 Bogart, aka Bogart's Casa, is a 3-year-old black male born April 29, 2011. His sire is Lonesome Cry and his dam is BF Gale. 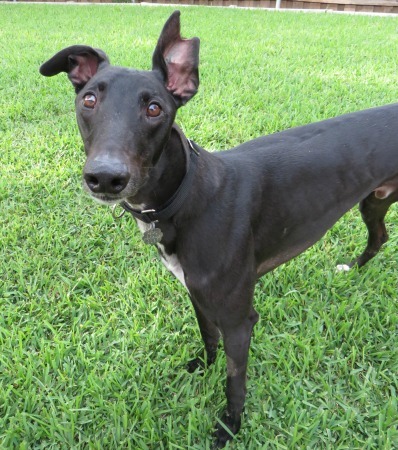 Bogart has 88 races on record, all at Gulf Greyhound Park. He started his career on December 14, 2012 and it ended on April 24, 2014 with a broken right rear hock. Bogart has passed an initial cat test. Bogart went to see Dr. Radasch for his surgery Wednesday, May 14, but things did not go as expected. When his splint was removed a compound fracture was found - bone sticking out and infected. The dead bone was cut out and then the leg was stitched up. His fracture is one of the worst we have seen. Because of the contamination in the area, a culture was taken to find out the best antibiotic to fight the infection. Surgery to repair the crushed areas will have to wait until a proper antibiotic is matched and administered for 2 to 3 weeks. The most likely way to salvage his leg will be to implant a plate with screws. Bogart is on pain medication to keep him as comfortable as possible during his wait. Bogart underwent surgery on June 11 to have an intertarsal arthrodesis (a fusing of the joints) performed. The central, as well as the 4th tarsal bone, were collapsed. These bones and the intertarsal area were stabilized with pins and wires. For additional support, a hybrid external fixator was applied. This apparatus will be kept in place for at least 12 weeks. Bogart is being kept very quiet in his foster home with minimal activity. Bogart's external fixator was removed on August 29th. He will be leash walked for the next 3 weeks while he undergoes the remainder of his medical procedures. Bogart has completed his medical procedures and is ready to find a forever home! Bogart has been a very easy boy to foster. He has good house manners, crates well, and loves food and walks. He walks on a loose leash, with one exception - when walking with other dogs, he wants to be in front! I guess he still has some of that competitive spirit in him. Bogart gets along well with the other dogs in the house, and has also mastered the art of living with cats, but we think he has the confidence to be an only pet as well. He is only sometimes interested in toys, but is definitely a big fan of chew treats. He's food motivated, and is very easy to train. Bogart bounces and snaps his teeth in the air when he gets excited, but does not jump up on people. He loves to be close to us, and is the first one to get up and follow when we move from room to room. This big boy has a big boy bark when strangers enter the house or yard, but he settles once he meets them and realizes they're guests. We're going to miss this love-bug, but we know he'll make an awesome addition to just about any family!